Welcome to Jerry’s 23 Car Wash.
Our three car wash locations are conveniently located in Midlothian, Bailey Bridge & Colonial Heights to serve all your car cleaning needs. Multiple self service car wash bays and state-of-the-art, touch-less automatic car washes for those with less time. Each location offers vacuums, shampoo and fragrance machines and a variety of vending products. All in a well lit environment with heated floors. 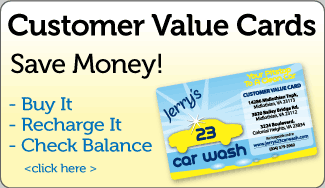 Change machines are on site, credit and debit cards are accepted and our loyal customer car wash discount cards offers great savings. Visit one of our convenient locations and see how easy & economical we make it for you to have a clean car. You may also reach us at (804) 379-3969.